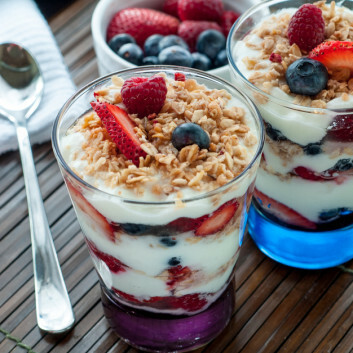 The power of this colorful parfait lies in its energizing combo of protein-rich yogurt and fiber-rich berries. A delicious way to start off your day—just grab a spoon and dive right in! In a pretty glass, layer ½ the yogurt. Top the yogurt with 1 teaspoon chia seeds then ½ the berries. Sprinkle with 2 tablespoons of the granola. Top with the remaining yogurt, berries, granola and chia seeds.